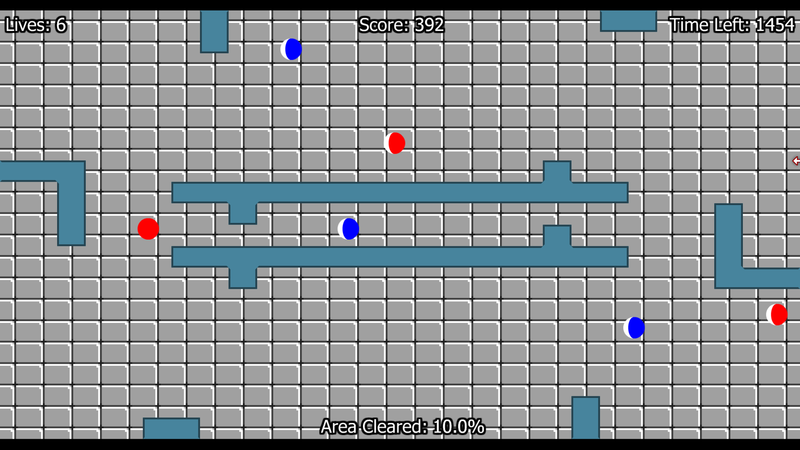 This game was created to be just like how the original JezzBall was 25 years ago! The graphics, the sound, the scoring, the physics, the tempo... they are all the same as they were in the original! Of course there are improvements as well; for example there's a much higher frame rate and fixed glitches. Plus a lot of bonus stuff such as alternative game modes and challenges. If you're more interested in the gameplay than the original graphics there are options to enable a more modern look. 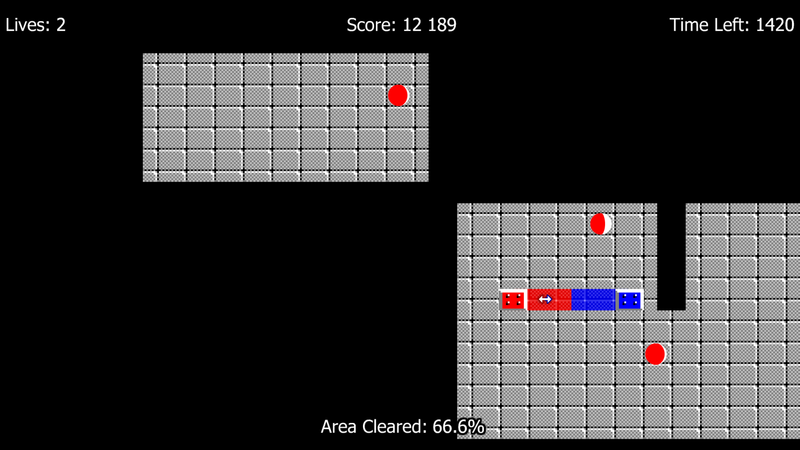 In JezzBall there are a number of Jezz atoms that bounces around. Your task is to build walls that contain them in as small space as possible. 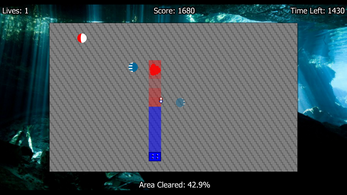 When over 75% of the capture chamber has been turned into wall the current level is completed and you move on to the next where another Jezz atom is added into play. To build walls you deploy a wallbuilder by left-clicking in the chamber. Right-clicking determines the direction. The wallbuilder has two ends that travel from the origin of your click, in the opposite directions from each other. A wall is constructed from the center in two pieces, if a pending wall-half is hit by a Jezz atom before it has reached an already existing wall it is destroyed and you lose a life. But it's still possible that the other half of the wall succeeds. Earn large construction bonuses at the end of each level by reaching over 80% area cleared on your last deployment. 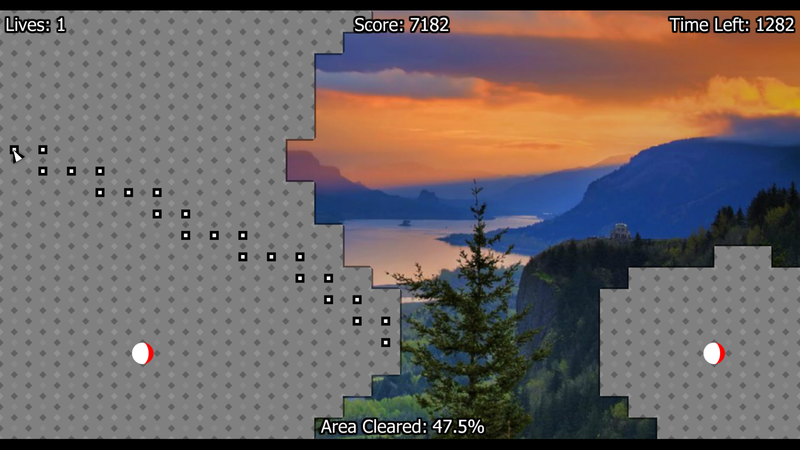 Get an even larger bonus by reaching over 90% area cleared! Time and lives remaining also adds to the end-of-level bonus so make your clicks count. 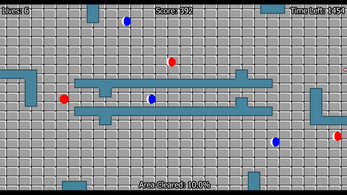 The original JezzBall experience! Into the very last detail; if you came looking for the JezzBall you remember you will not be disappointed! Four profiles (one reserved for guests) with their configurations stored separately. 700 beautiful background images (real life photos). Go to the "Graphics" config screen to enable it. Will place a random image into the black walls each level. 8 music tracks of classic MIDI tunes you'll probably remember! All recorded using SoundBlaster 16. You can set up to 24 music audio events if you want to. 60 fully customizable SFX audio events - change which sample(s) to play or change individual volumes. A pool of 300 sounds are available from various old games. 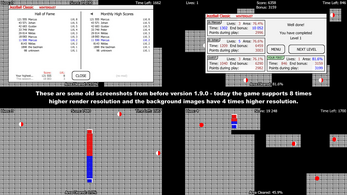 Automatic saving of all games in progress. Stop and continue whenever you want to! Local high score lists. In the Hall of Fame your name will last forever and on the three other lists you will see the daily, weekly and monthly high scores. Level records. 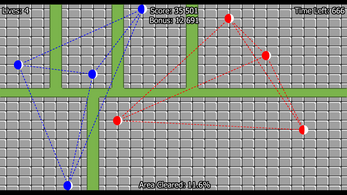 All your best statistics are saved on each and every level you complete. Profile records are comparable. Smart and very customizable controls. If you have a touchscreen you can play using your fingers. 83 mods that once activated changes how the game is played! Use none or pick one/several at the same time in any order. 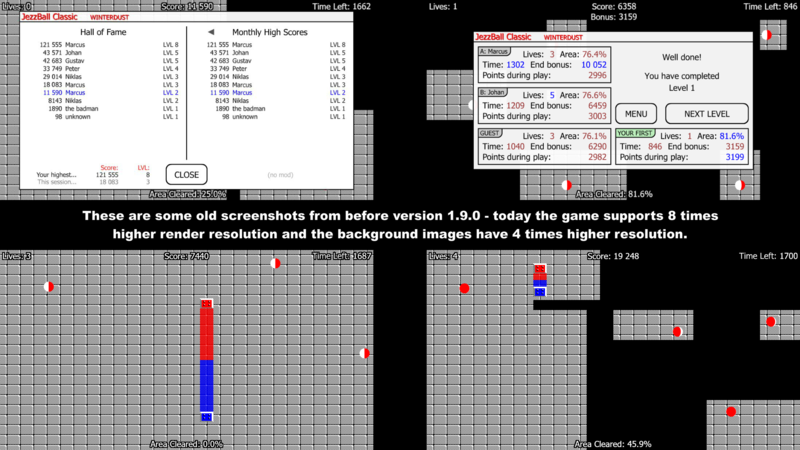 High scores and level records are stored separately for each combination. Some mods will just change the amount of time/lives you have while other will drastically change gameplay (allow you to use two wallbuilders at the same time for example). 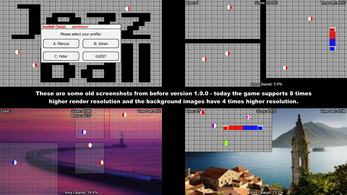 22 preset mod-combinations are provided in addition to the original JezzBall experience to give you variation. 100 rooms that will stimulate your intellect as well as your ability to time your deployments! Can you solve them? There are also missions available to inspire you to break your personal bests. Completing them all is an achievement! 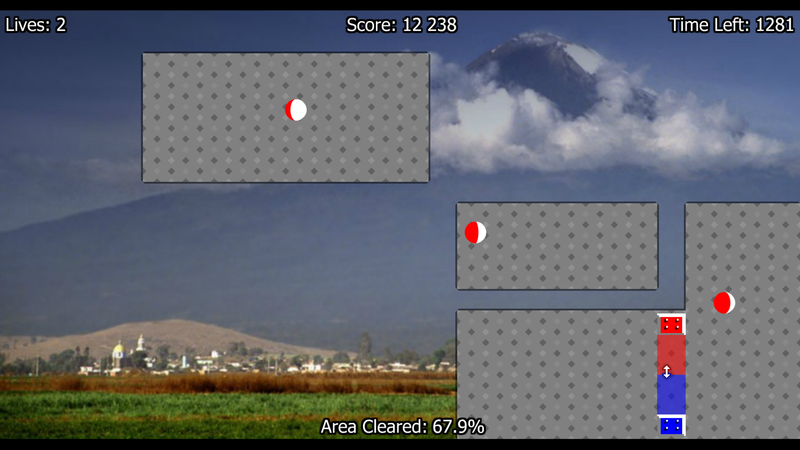 If you have Java installed you can run an included utilities program that will help you add new background images or audio samples to the game. Note: The utils aren't included in the demo. These will seal off the capture chamber with walls, one cell at a time. They are usually deployed as a pair and will can withstand being hit by an atom when fortified. If the 2WA mod is in use you'll be able to deploy four wallbuilder ends at a time. These two are put into action if red and blue has already been deployed. The classic Jezz atom! This baby's worth a lot of galactic credits back on Earth. Yields the most energy when tightly confined. Kind of the negative version of a Jezz atom. Usually doesn't like to mix with its Red-White counterpart. Capture this atom in its own area to gain a life! 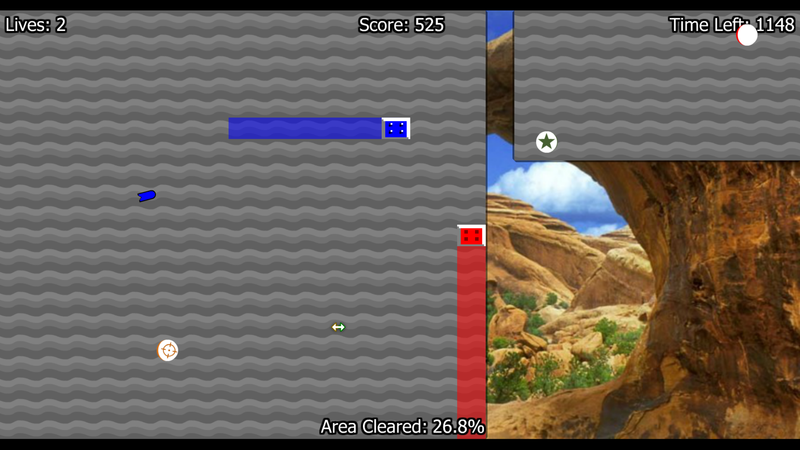 It appears after you've cleared 25% of the level's required area and disappears when you've only got 25% to go. Capture this atom to gain a bonus between 10k-20k points! How much you get depends on how long it took for you to capture it. This purple atom appears when a certain amount of cells gets filled with wall. Capture it to freeze atom movement! While frozen the medkit and bonus atoms doubles in value! If this atom find itself alone in an area it will teleport 75% of the other atoms into its own area. 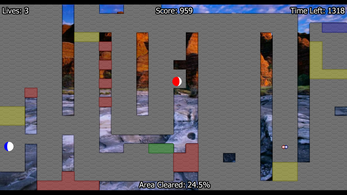 Expect homing missiles to be launched at your wallbuilder ends whenever you deploy in the same area as this atom. Upon impact the hit end will be stunned for a second, leaving it vulnerable to incoming atoms. An aggressive atom that will dash towards pending walls in order to destroy them. After a short while it will instantly leap into it! Moves twice as fast as regular atoms. Be careful about capturing it into its own area - it will slow down but in turn speed up all other atoms! You'll recognize this game mode all the way back from 1992. A fast-moving wallbuilder and more atoms per level! Perfect for a nice casual game. But be careful with your deployments since the wallbuilder ends aren't fortified. You only have 20 lives and you don't receive new ones. 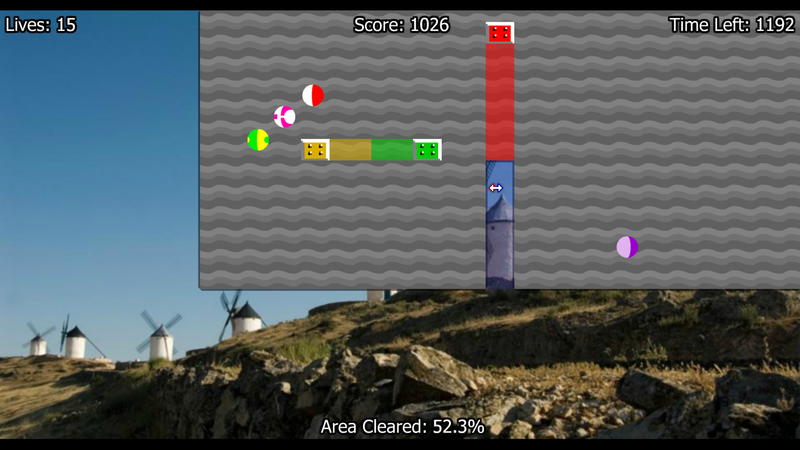 The bonus atom is in play, use it to increase your score to new heights! You start with 15 lives and don't receive new ones each level, but luckily you have the opportunity to capture a medkit atom to delay the inevitable. The bonus atom is also in play as well as the freeze atom. Stop time to double the effects of the bonus and medkit atoms! Play your cards right and you'll go far. Trap each Jezz atom in its own area. Your biggest worry here is not to get two atoms stuck next to each other so that you are unable to separate them. Trap each Jezz atom in its own area, just watch out so you don't make it too small! If you do the imprisoned atom will escape to a larger nearby space. Use the freeze atom to quickly trap the regular atoms and reach 50% area cleared before anyone can have a chance to escape. 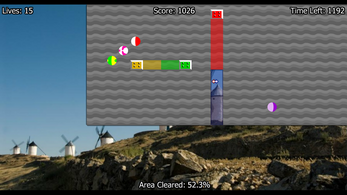 Use your fast wallbuilder-dogs to separate the red and blue sheeps into different groups. Be quick about it because time is sparse! And be careful so that your dogs doesn't run into a sheep, you can't afford to make many mistakes since you only have 4 of them each level. Separate the red and blue Jezz atoms from each other and put each atom into its own space. Your pending walls are shielded but don't lose your focus or you will put yourself in a situation where the level can't be completed! Help the atoms find their kin in these randomly generated labyrinths. The atoms must see all other atoms of the same color and blue and red line-of-sight must not cross. Lives are extra valuable towards the end bonus. 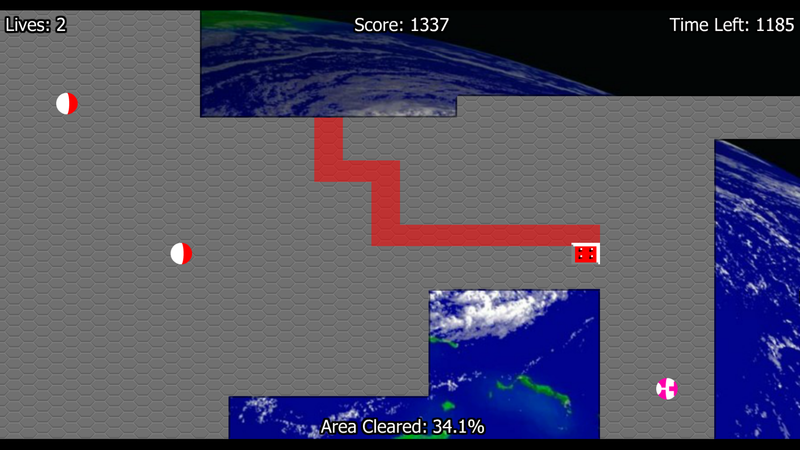 Reduced time and you only have four lives each level. How far will your nerves allow you to go? Your pending walls are shielded to withstand one hit. You only have a single life on each level though so make sure a pending wall is not hit twice! Also take extra note of the unprotected wallbuilder ends. You can't lose from getting 0 time so only deploy when you are sure it's safe. The good news is that you don't lose lives when a wall under construction is being destroyed. The bad news is that you only have a certain number of walls to build with and the waillbuilder ends aren't fortified. To survive you must master the art of building with only one wallbuilder end. Time your construction well because you have very few chances. Especially since your last deployment doesn't count - as soon as you reach 0 lives it's over. All that matters here is speed if you want to get good bonuses. 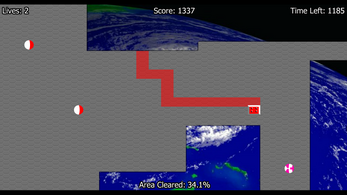 Finish the levels as fast as you possibly can! Just don't forget to keep your lives over 0. More lives and less percentage to cover. However, the time you have is very low so you best act fast! Very fast. Draw the walls instead of building them the normal way. Start dragging next to an already existing wall and release next to another already existing wall. Watch out since your wallbuilder ends aren't fortified and you have halved amount of lives. 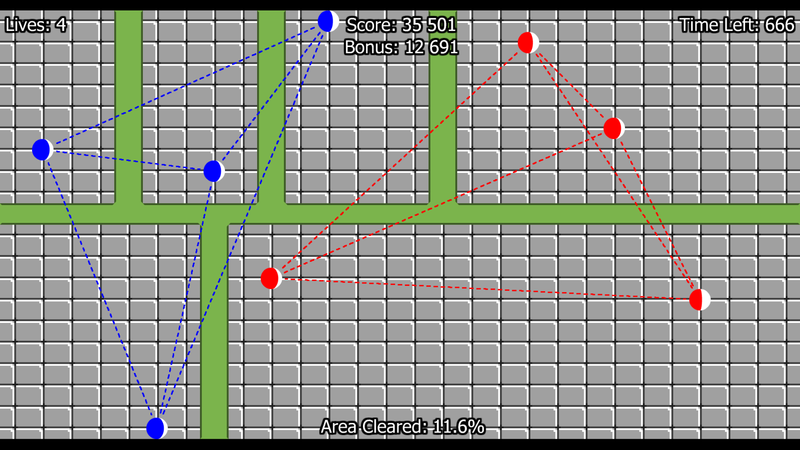 Avoid straight walls to gain up to 9999 bonus points per draw! Take control of the red wallbuilder end and build walls directly instead of building them the normal way. 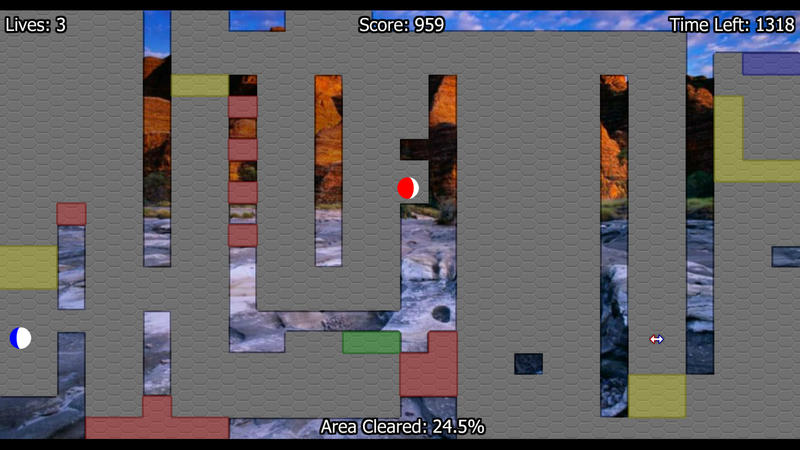 Decide which way the wallbuilder goes by swiping across the screen (or by using the arrow keys on PC). Catch the medkit atom to gain lives and thereby increase the end-level bonus. The play area has turned into a militarized zone and you're in charge. Think twice about your deployments since the missile atom will try to stun your wallbuilder ends. Use the general atom to reposition troops where they won't get in the way. Remember to use your second wallbuilder. Lava has somehow gotten into the capture chamber. The Jezz atoms doesn't seem to be affected but it will destroy any wallbuilder end. Plan your deployments carefully to avoid disaster. To your help you have the REA mod, which makes it a lot easier to deploy only one wallbuilder end at a time. Everything moves at twice the normal speed! You start with one life more than the number of atoms. After a few levels it will be the other way around. Every level has a pre-built wall piece in it to aid you but in turn two new atoms are added into the chamber instead of one. You're stuck in a cave filled with angry bears! The only way out is to trap them. Be mindful of papa bear since he will dash at pending walls. Your wallbuilder ends aren't fortified so keep your distance. name to the right of the "New Game" button on the main menu. JezzBall stands its ground as one of the most addicting puzzle games and I promise you will find JezzBall Classic both challenging and enjoyable! Do you wish to check out the game before you buy it? What's new in version 2.0.0? + Changed (simplified) preset "The arcade" to differentiate it more from "The arcadium"
+ Changed preset "The shepherd" to differentiate it more from "The divisor"
More version history can be found on the game's homepage. There is no installation required, just unzip and start playing! 100% DRM free. You don't need to create an account here on itch.io in order to buy this game. Note: Some additional info may be required for tax purposes during purchase, if so you will get a "Billing address" message before being taken to PayPal ("2015 VAT MOSS regulations for EU"). Simply fill out the form and press "continue payment". The info is used to calculate what VAT percentage to add on top of the $4.99 (if you live in USA it will always be 0%). Quick note: I've been told that the game might not start on Windows 10 after a recent update from Microsoft. This can be fixed by renaming the file "JBC.prg" to "JBC.exe" and starting the game with that exe instead of the normal "JezzBall Classic.exe". Sorry for the inconvenience. I paid for this on my credit card but how do I find the JezzBall game? The download link (a .zip file) should be on the JezzBall Classic page when you are logged in on your itch.io account, above the demo download. Não foi possível processar seu pagamento agora, tente novamente mais tarde. Pedimos desculpas pelo inconveniente.